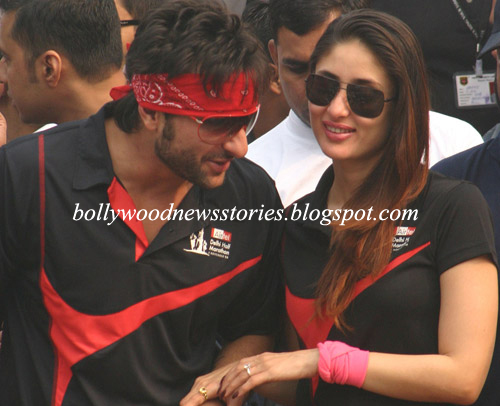 new: Kareena Kapoor-Saif Ali Khan Wedding Date Fixed? Kareena Kapoor-Saif Ali Khan Wedding Date Fixed? D-Day set for Saifeena wedding? - It seems that actor couple Saif Ali Khan and Kareena Kapoor have finally fixed a date for their much-awaited wedding. Mumbai: The most talked-about couple in B-town has finally decided upon a wedding date. Kareena Kapoor, 31, and Saif Ali Khan, 41, will Marry a week after the release of 'Agent Vinod,' a spy thriller both actors have been waiting for with bated breath. Saif Ali Khan's sister, Soha Ali Khan has revealed to a TV channel recently that her brother Saif will tie the knot with Kareena a week after the release of 'Agent Vinod'. Sriram Raghavan's 'Agent Vinod', which has the star couple as its lead, will hit the theatres on March 23rd. A week after that would ideally mean March 30th. So if our calculations and their decisions are correct, then we can expect to see Saifeena happily wedded by the 1st of April. And let's just hope this is not a prank! Earlier, Kareena had said, "Both Saif and I are waiting for 'Agent Vinod' to release. Once it opens, we will announce the date of our marriage." Let's keep our fingers crossed that we get to see one of the biggest weddings of the tinsel town very soon!